It’s been a while since I have posted here again, but I have been working on my CHTM reinforcement learner all along! I got it to perform pole balancing based on vision data of the pole alone recently, but only for a few seconds at a time. But that is a topic for another post. In this post, I want to discuss the changes and improvements that have occurred in CHTM – land. For those unfamiliar, CHTM (continuous hierarchical temporal memory) is a generalization/simplification of the standard HTM developed by Numenta that uses familiar concepts from deep learning to reproduce the spatial pooling and temporal inference capabilities of standard HTM. The main change is that instead of using binary values for everything, we now use real-valued numbers for everything. This makes it simpler to code, and also provides some extra capabilities that the original did not have. First let’s lay down the data structures we will be using in pseudocode. A layer consists of a 2D grid of columns. Each column has feedforward connections to an input source, taking a subsection of the input source (within a radius of the column). Each column also has a number of cells in it, which have lateral connections to other cells in the same layer within a radius. CHTM, like the original, has two parts to it: Spatial pooling and temporal inference. Let’s start with spatial pooling. I will use the notation _(t-1) to describe values from a previous timestep. Essentially what we are doing here is getting the negative distance between the input region and the feedforward connections vector. So the closer the column’s feedforward connections are to the input, the higher its activation value will be, capping out at 0. Here column states are set such that they are a sparsified version of the activation values. Along with that we update a usage parameter, which is a value that goes to 1 when a column’s state is 1 and decays when it is below 1. This way we can keep track of which columns are underutilized. Here we move underutilized columns towards the current input vector. This way we maximize the amount of information the columns can represent. Next up: The temporal inference component! After coming up with many wild theories and spending several afternoons thinking until my head hurt, I finally came up with a solution for incorporating HTM with reinforcement learning. The original idea in my last post is still somewhat related, but it has changed a lot. At first I wanted to take a “predict what you want to see” approach with HTM. So I perturbed the columns and cells into the direction of maximum reward (just following the Q weights basically). However, I quickly realized that this wasn’t going to work due to the strong interdependence in the columns. I tried to find a way to maximize reward by modifying actions analytically at first, but the solutions I came up were either way too complex or simply didn’t work. So finally, I took a somewhat strange way out. In order to find the action that maximizes the Q values, I simply used simulated annealing to derive the optimal action. This solution uses nothing besides HTM and simulated annealing. 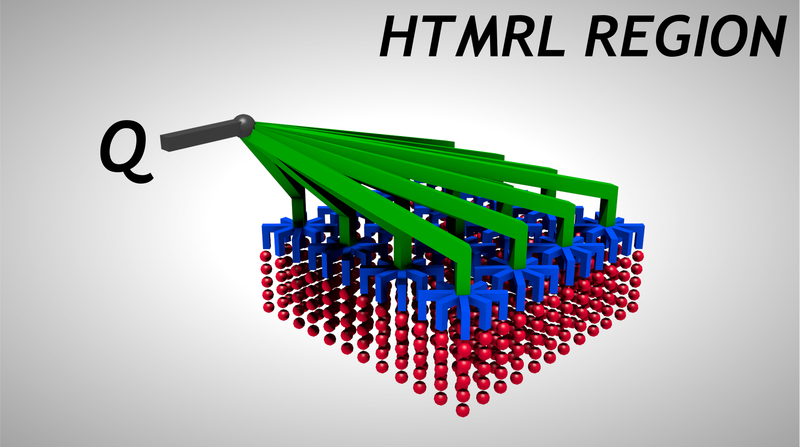 It is a “pure” approach to HTM reinforcement learning in a way. Now one would think that this is super slow, inefficient, and in no way biologically plausible. The last one might be true, but it is actually very efficient and fast. I don’t have to derive completely new actions from scratch every time: I can used the prediction of the action that the HTM region provides as a starting point. So, I really only need to have 1 simulated annealing iteration per step, since the HTM region will store intermediate results that can be built on over time. So it’s sort of like annealing over time with memory. This property also makes the system highly scalable, something I will need once I start learning off of raw Atari game frames. And it actually works! I just got it to work right before writing this blog post, so my test of its capabilities is kind of lame (mountain car problem), but don’t worry, more complicated tests (the Atari environment) will come! So here it is doing the mountain car task. I am using my CPU implementation in this video, since it made experimenting easier. I took a short break from attempting to beat Deepmind on their Atari results, but this is because during my research I came up with a technique that I figured would be worth publishing a paper on. So, here it is so far, feedback is welcome! 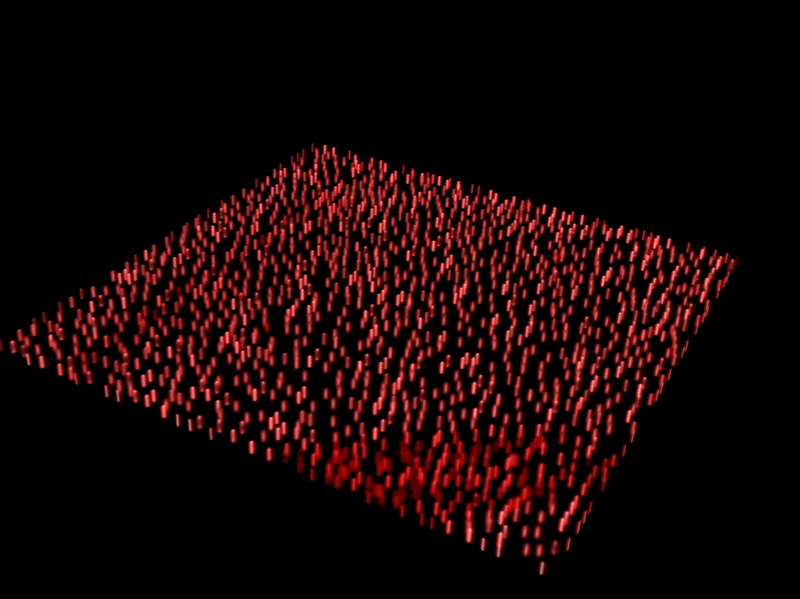 I did a rough performance test on GPU HTM, and I was able to simulate a region with 16384 columns, 65536 cells, 1.3 million column connections and 21 million lateral connections at 80 iterations per second. I don’t know if this is a lot or not, but keep in mind that I have not yet optimized it. My GPU is a Radeon HD5970. I have been working on my newest version of HTM-RL. The old version was able to solve the pole balancing and mountain car problems quite easily, but had difficulties as soon as one started adding more regions to the HTM. As new regions were added, the HTM would get increasingly stable. However, it gets so stable that one cannot perceive subtle changes in the input from the sparse distributed representation of the topmost region. So previously, HTMRL could only learn off of very general concepts that don’t change very rapidly (when more than one region is used). So, it could for instance identify where the most enemies in space invaders were located, but it could not distinguish them individually. I have come up with a new method that will allow it to use information at all levels of the hierarchy. It is a form of hierarchical reinforcement learning. The idea is as follows: Have each HTM region represent both the state and the last action taken. Then, for each level of the hierarchy, use a function approximator that maps the column outputs to a Q value. Starting at the topmost level in the hierarchy, use a form of gradient descent on the “action” columns to optimize the Q value (make it as large as possible). This becomes the region’s suggested action. From there, descend down the hierarchy, and again optimize the Q values. But, before the optimization takes place, incorporate the next higher layer’s suggested action into the region’s action output (using a weighted average, for instance). This way we essentially start with the most general, high-level description of the action, and then perturb it into a more and more fine-grained action as we descend down the hierarchy, based on the Q values. Here is a Blender render I made that shows the structure of the function approximator that is attached to a single HTM region. Please excuse my poor modeling skills! By the next update I want to have HTMRL up and running. Let’s see if I can make it! The past 3 days I have spent on writing a fast GPU spatial and temporal pooler. It works! Unlike Numenta’s HTM, it both operates in the continuous domain and is much, much simpler. I don’t think I sacrificed any functionality by converting the discrete logic of the original into continuous formulas. I sort of just made up formulas as I went, until it gave me the desired result. Not very rigorous, but it got the job done in the end regardless. So, I would like to now describe the formulas that I came up with. Hopefully someone finds it useful besides myself. Continuous HTM is not well researched, if at all. I will assume that you know how the original HTM works to some extent. For instance, what the spatial and temporal poolers are supposed to do. I am not going to use proper indexing (e.g. wij as opposed to simply w) for formulas, I will rather describe in words how the operation is performed given the indexless formula. This is not supposed to be a paper, just a way of giving a rough idea of how the continuous spatial and temporal poolers work. The continuous spatial pooler consists of 2 2D buffers of floats, the activation buffer and the column output buffer. The activation buffer receives input from another 2D buffer of floats, the input buffer. It has connections to a subregion of the input buffer for each element of the activation buffer. These subregions are positioned such that the normalized coordinates of the positions in both the input and activation buffers are the same. Where a is the activation value, w is the weight of the connection, and in is the input corresponding to the connection. The activation value is stored in the activation buffer. Where O is the output to be stored in the column output buffer, a is the activation of this element, m is the maximum activation across all elements in the inhibition radius, and c is a constant “intensity” factor. So, for each weight, we want to perform a hebbian-style learning rule. Oja’s rule is a version of the Hebbian rule that does not increase without bounds. Once we have the outputs of all of the elements of the column output buffer, it is time to compute the outputs of the cells within each column. Cells are represented by 2 3D buffers: The cell state buffer and the cell prediction buffer. The former contains the cell’s outputs, and the latter contains future predictions made by cells. We also have an additional column predictions buffer, which is 2D, and represents the predictions the cells gave to a column. We first use a “soft” winner-takes-all scheme (so more like “winner takes most”) in order to give a higher output to cells which were previously predicted most accurately. This helps form a context for a column. The cells indicate which predictions activated this column into the predictive state, allowing future context-sensitive predictions to occur. While doing so, we keep track of the smallest error, which we will call x.
where c is again an “intensity” constant (doesn’t need to be equal to the previously mentioned c, it’s a different constant). where w is in this case the cell lateral weights, S is the cell state to which the weight corresponds, and c is again an “intensity” constant, which can be different from the previously mentioned c‘s. where P is the column’s prediction. I would make a video, but I fear it would be too difficult to explain what it means. So instead, I will release a demo program along with source code within the next few days. Until then, you will have to take my word for it that it indeed works! I will edit this post to contain the link as soon as it is available. How is this useful for outperforming Deepmind? I have a plan on how to elegantly combine this continuous HTM with reinforcement learning, based on concepts discussed in my previous post. I will explain it in the next post, since this one has become quite long already. I recently found an interesting paper (http://www.plosone.org/article/info%3Adoi%2F10.1371%2Fjournal.pone.0029264). It describes a method for applying MPF (a superset of HTM, Memory Prediction Frameworks) to reinforcement learning, and I really like the idea behind it so far. From what I gather, the idea is to do an upward pass on the MPF to form increasingly invariant and abstracted forms of the current and past inputs. One then descends down again and combines information from the upper levels with the more fine-grained information at the lower levels. While doing this, one can perturb predictions such that the system is more likely to predict inputs (consisting of state and action) that lead to higher rewards. The authors actually mentioned that they also wanted to use it for game playing, which is my goal. Since then I have been very excited at the prospect of using MPF and MPF alone to do the reinforcement learning, and have started extending my existing GPU-HTM to include temporal pooling as well as the backwards pass and action-generating perturbations. Features at each level in the MPF hierarchy can be used, and combined with features from previous higher layers on a backwards pass to add additional context to actions. No need for experience replay, which is slow and inelegant – MPF is designed to work online from the beginning. Can be run easily on the GPU, using images (textures) to store weights, activations. Partial observability is easier to handle. Less material to work with – less papers. If something goes wrong, I am unlikely to find too much help. Input encoding may be difficult. However, since my version of HTM operates using continuous cell and column states, this might not be as difficult as it first seems. I have already written a GPU temporal pooler with one-step prediction, which should be sufficient for now. As with my spatial pooler, it operates on continuous cell/column states, unlike Numenta’s HTM. It’s been a couple of days, so I would like to show what I have been working on. I now have image-to-features system, one fully functional and another that was functional but is receiving an overhaul. The former is an implementation of HTM’s spatial pooling in OpenCL. Unlike the CPU version though, this version works with continuous values. It forms sparse distributed representations of the input, but leaves out the temporal pooling portion of the fully HTM algorithm. The temporal pooling is significantly more complicated than the spatial pooling and not nearly as GPU-friendly, so I decided to just do spatial pooling for now and let the reinforcement learner take care of partial observability. The second system is a convolutional stacked autoencoder. It runs online, and was rather difficult to parallelize due to the need for a summation of all of the gradients for each position of the filter in the receptive field. To parallelize the summation, I made a large reusable buffer that stores all the gradient values for all the convolution positions, and then did an additive downsampling. 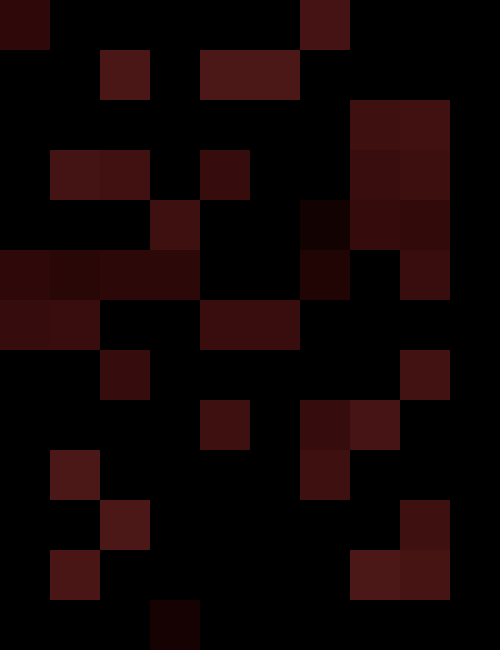 This adds 4 sub-gradients at a time (a 2×2 square) in parallel. I originally had max-pooling, but since I do not want translational invariance I removed it again. The code is not part of the main repository yet, but I will soon upload the modified ALE along with the new code. The reinforcement learning portion is done, so now I turn my attention to the image recognition portion so that I may scale up better to the ALE. I originally tried to go immediately to the ALE, but it takes so long to find out whether or not what you did is working so instead I decided to stay with pole balancing. However, instead of feeding values such as position and velocities of the cart directly to the HTM bottom-most region, I am now using an encoding of the image of the experiment. This provides me with an intermediate step on the path to scaling up to the ALE. At this point, I could dump the HTM stuff and just do ConvNets, but that feels like a cop out. I have found an interesting paper that compares CLA (HTM) to the state of the art, and they showed that it indeed outperforms things like convolutional neural networks (they used LeNet), mostly due to the time signal, on tasks where sequences of information are presented. I have such a task. So, I will continue working on my HTM implementation and improving it. I am currently in the process of reading that paper (available here:http://bias.csr.unibo.it/maltoni/HTM_TR_v1.0.pdf) to see how they were able to adapt it for classification (from which I can adapt it to function approximation). EDIT: Upon further examination, the paper’s validity appears questionable. The “HTM” they use is also very different from Numenta’s HTM (the one I am using). I am still not quite certain if I am encoding the greyscale images properly for the HTM, right now the regions are way too stable. The previously mentioned paper talks of feedback signals from higher regions in the hierarchy that allow for adaptation of lower levels with the context gathered from the higher levels. My current HTM model does not have this, so I am very interested in seeing how that affects things for reinforcement learning. For those just seeing this for the first time, the source code for this is available here, under the directory “htmrl”:https://github.com/222464/AILib It uses the CMake build system. That’s it for this update, until next time! As I stated in my previous posts, the precision of the function approximation remains a problem. However, I have found that using SARSA instead of Q learning (on-policy instead of off-policy) mitigates the problem a lot since it is no longer bootstrapping on the largest potential value (subject to overestimation) but rather the potential value of the selected action. Due to this improvement, I decided to move back to feed-forward neural networks with RMS training. The RBF networks train much faster, but they seem to forget things faster (things not part of the replay chain). I assume this is due to the on-line supervised learning that occurs, which can destroy previously learned information quite easily in favor of better matching new information. I now have HTMRL performing both pole balancing and the mountain car problem with very little training time. It figures both of them out in under a minute usually. I started scaling up to the Arcade Learning Environment, and did some short test runs. I also did a lot of optimization, since I want it to run in real-time (Deepmind’s algorithm was not in real-time as far as I know, and took more than just one standard desktop PC). I have not yet trained it enough to get decent results (5 minutes is not much), but I will probably try an overnight run soon. For the continuous action edition of the algorithm, I experimented with free-energy based reinforcement learning. It learns a value function as usual, but it can easily derive a continuous policy from the value function. I started implementing replay updates for this as well.